... an advanced System Monitoring Widget for macOS. 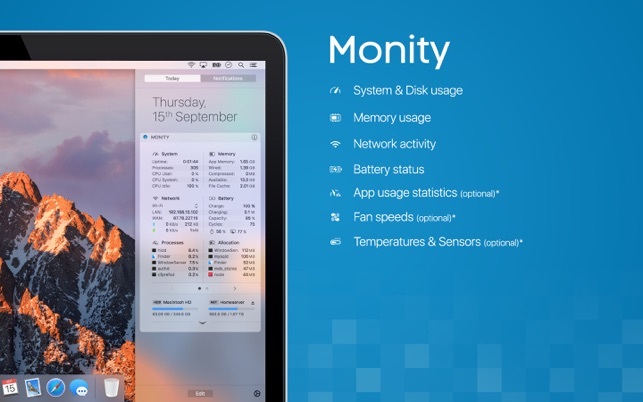 Monity takes place in macOS Today View and oversees your components statistics. Having an eye on your systems and network usage without messing around like before with huge and uncomfortable symbols in the menu bar was never so easy. • Detailed App usage statistics about CPU utilization, Memory usage and Energy impact. • Detailed statistics by numerous sensors for Temperature and Power consumption. • Information about current revolutions per minute (rpm) for integrated Fans, as well as their limits. • Sort and arrange Panels through multiple pages. Let us know about all your feature suggestions, we’d like to know how to improve the next version of Monity. We’re always happy to hear your feedback! *Get additional Panels and Statistics by downloading Monity Helper inside the App under „Get more Panels“. As a developer myself, I can contest this is 100% safe. Being able to see network speeds is worth the price itself. Its not a magic wand, but if your fans are raging, perhaps take a look at the System Usage or maybe look into the processes that are running. (shows both) As for the Helper Tools, since there is a little pad lock next to the URL, its means its safe, the owner of sites identity has been verified, take a look at the certificate if you like. It never circumvents any security if you allow apps down loaded from App Store and IDENTIFIED developers. Trust me, you run more risk closing popups in your browser, the only thing I find shady is not saying thank you for the free helper Tools. Just a suggestion, but I think being able to Favorite something in the menu bar would be handy. Oh… and thank you for the awesome widget, well done! I have a Macbook Air and as you know, the battery is (claimed by apple) to last around 12 hours of basic web usage. Now when running Logic Pro X which is a power hungry appliction, i would never get 12 hours or battery from a single charge. I bought this app to see what the temperatures of my Mac Book Air were because it seemed to be running hot. 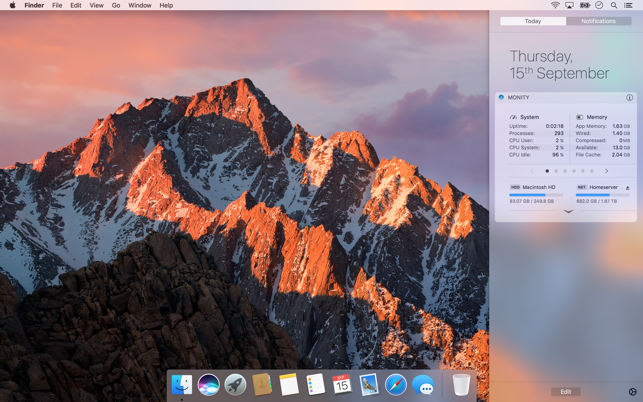 This application is great when showing me the temperature and other elements of my macbook but my battery seemed to be dying quicker with it installed. now keep in mind you need monity helper which is a add on that you need to view temperature and fan speed. Now, if yourusing this on a desktop computer, PERFECT. Since there is no battery issue with those i would totally recomend it. But with a Macbook, i would not recomend it. Im currently in school and i can not worry about battery life so the most i can get, is better. The Activity Moniter was showing about a 17.5 energy consuption from Monity Helper!!! Thats ridiculous. Logic pro X uses about 25.5 energy consumption. 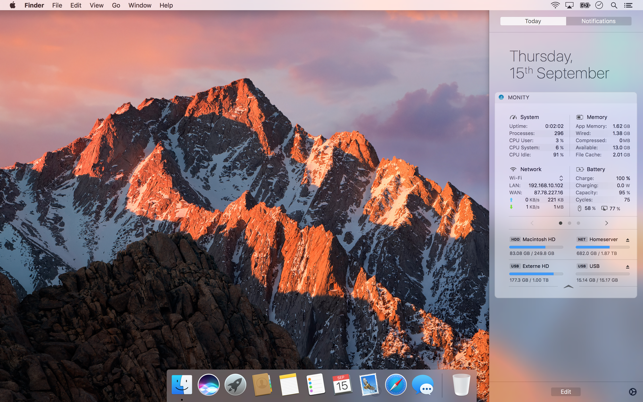 For the most part Monity is smooth and pretty, giving useful insights into how your mac is performing. Unfortunately, there is no way to look at my CPU temperature in the “Today” section as an average of each of the four core processors. The actual application tells you how hot each component of the computer is getting, so I can see that my temperature right now is 58°F, but the “Today” widget says that it is 136°F. My computer is obviously not running that hot and I assume it’s adding the temperatures of each of the core processors together but for some reason does not divide them to give me the average. 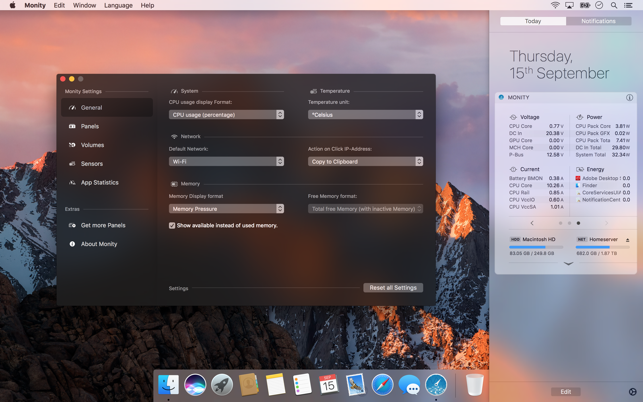 I don’t want to have to go to my calculator every time I worry about my computer overheating, and given the option I’d prefer to just swipe my trackpad to notifications to get that information rather than finding the Monity application and opening it just to get an accurate assessment of my cpu temperature.